We have rounded up all the cards that were revealed today. Eager Underling was unveiled by Chinese site YingDi. Magic Trick was revealed by Japanese site 4gamer. Crystalsong Portal was revealed by Chinese streamer YiJinYeXing. He also accidentally (?) revealed the following card. Its actual name is unknown. Nine Lives was revealed by C4mlann. The video is in German. 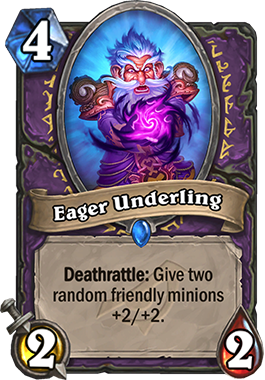 Eager Underling looks like a class-specific, slower replacement for Fungalmancer. The latter was too strong in my opinion, this one is more reasonable. Well, it looks slower on the paper, but I have no doubt that our Warlock fellows will find ways to accelerate it. 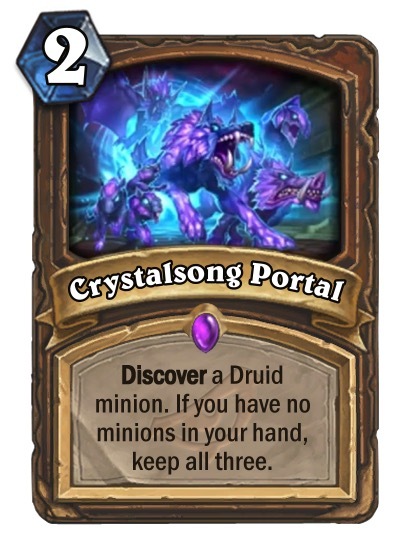 Crystalsong Portal is an Omega card in disguise. Specifically it looks like an Omega Assembly for the Druid, just a little more expensive. Decent value in early and mid game to pick the most appropriate minion for the current game state, and potentially high value in late game if your hand gets empty. Alternatively it could be a permanently high value card in a Spell Druid deck, but I can't remember seeing that kind of deck before. It also has the potential to be great in certain types of Tavern Brawls. 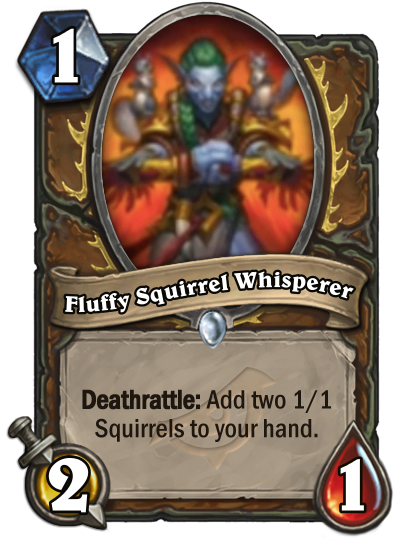 If Fluffy Squirrel Whisperer is real, it is a high value card, which will replace Fire Fly in Druid decks. Vendetta looks very good. With Academic Espionage, Blink Fox and all the other similar Rogue cards, fulfilling the condition to play it for 0 mana should be pretty straightforward. Nine Lives has Savannah Highmane written in big bold letters as a subtitle. Even the illustration leaves little room for doubt about the designer's intention. Use that way, value is insane and I wouldn't be surprised if either card gets nerfed soon after Rise of Shadows is released. It will fill the spot left free by the rotation of Play Dead, and while obviously slower, I think it is much, much more powerful, in particular due to the Discover part which will put almost no restriction on the rest of the deck. Plot Twist is definitely original, but at the moment I can't think of a way to make good use of it. A puzzle to solve for expert deck designers, of which I am not. Plot Twist might be one of the best cards revealed so far in this set. Its basically card draw w/o fatigue. For a class with no draw problems, that card will be at least one of in every slower deck. 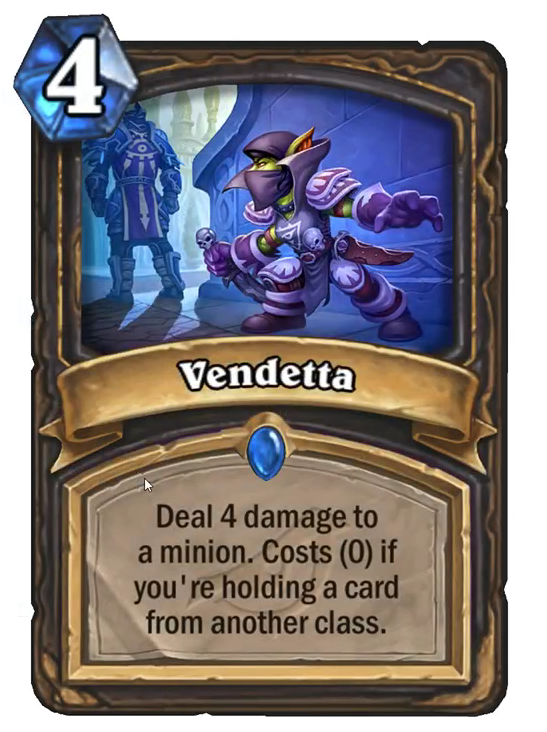 Vendetta is really strong, it is the card which helps Tess Rogue with something; early board control. Really good against aggro/midrange. Deck beats control anyways. Great addition. 1 mana druid minion is a okay Turn 1 play. I don't think it is anything special. Eager is good but maybe not enough. The difference between fungalmancer is the same between battlecry and deathrattle: speed. This card is slower, demanding either the minion to die naturally or another card to kill him. The first way isn't good at all (your opponent will clear your board before killing that mere 2/2), while the second needs a deck built on killing your onw minion synergy. So, this card will played or not depending on how strong this "suicide" warlock will be, and how it will be strong compared to a regular zoo build. 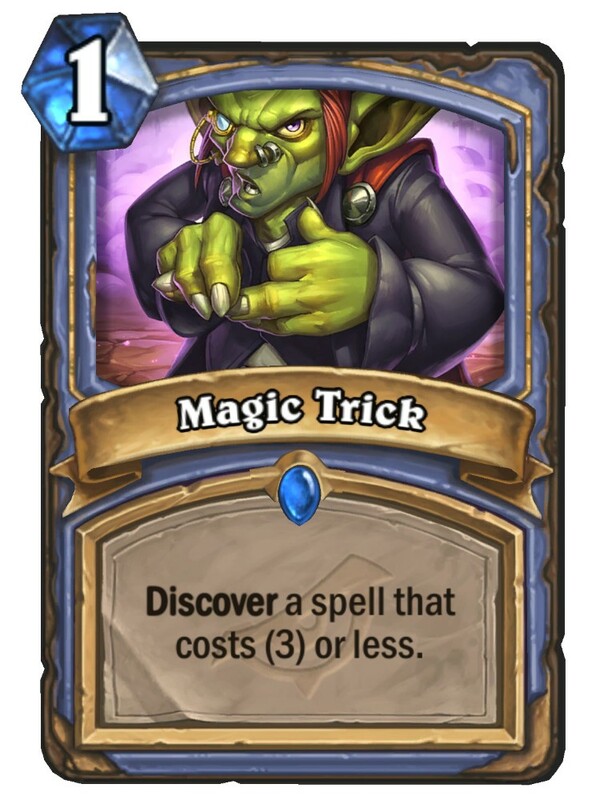 Magic Trick is good only either in a small spell mage (and other cards have this synergy in this expansion) or in quest mage in wild. Every other build will put a good spell in their deck, instead of hoping to discover one with this. Crystalsong Portal will be very good in a very specific build, if that build will exists. Spell druid or something like that. 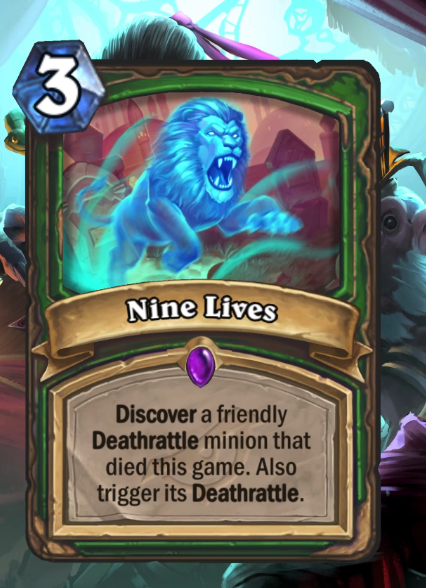 Nine lives is showing how blizzard is pushing some sort of Big Hunter archetype with a synergy with deathrattle other then just pure big stats. I like it, but I bet that people will hate it if it'll be high tier enough. Plot twist is bad, no good player will even play it. Trading card advantage with another mulligan option isn't good at all. Combo won't use this because for drawing other combo pieces you'll lose the ones you have already drawn, and other decks will like neither the tempo loss nor the value loss. However, if there is a combo that can make you going infinite with this....... I'll play it. Maybe with an Elek or 2? I really like that something like Plot Twist exists. Its an interesting card no matter how good it is. I would give it at least some potential. Imagine you play some sort of midrange-non-combo-control-like-warlock, your hand is filled with stuff that is mediocre or unplayable against your opponent (maybe he playes only small minions so you don't need your hard-removal etc. )...in this case exchanging your hand would be great. But the biggest application I can come up with is exchaning your EVIL-Lackeys against "real" cards from your deck (and making your deck worse). Oh by the way...the artwork of "Magic Trick"... Woah! He is ripping of his own finger! He is not. There's a trick! I think that the answer is "you should build your deck better" or "you should take away mediocre cards before adding a card that is good only if your deck is not". I don't want to be rude, it's just experience: in yugioh, a card game that doesn't have a mulligan phase and where the first turn is the most important one, similar cards are considered trash. I bet that also in Hearthstone they'll be trash, but I can be wrong, of course. Fully agreed. If Plot Twist is going to be good for something, it will be for specific combos with other cards in your own deck, and not to recycle a crappy hand. You should not include cards in your deck which pose a high risk of being completely useless against a significant share of opponents. Sure, sometimes you'll have cards in your hand which are not as good as they could be, because of what the opponent is playing, but you'll have to learn how to minimize your losses and still get the best possible effect out of these cards. At the end of the day, you should never have more than 1 card in your hand which you really can't play, so Plot Twist would just reimburse itself and you wasted 2 mana. 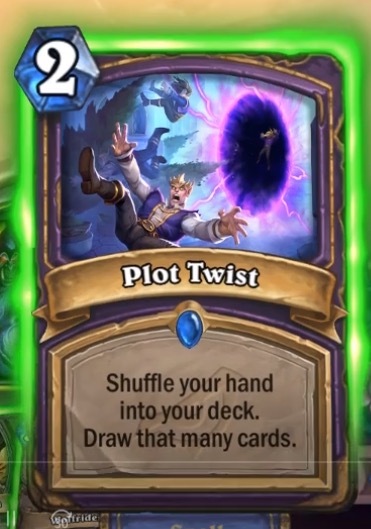 The target for Plot Twist is combo with cards which do something when you put cards into your deck, and cards which do something when you draw cards. Among the cards revealed so far for Rise of Shadows, Fel Lord Betrug stands out. From previous expansions, The Soularium would work too, as well as Dollmaster Dorian. If Warlock ever gets a casts-when-drawn card generator, it will be a candidate too. At this point, my feeling is that there are not enough cards taking benefit from it to make it work, however that could change depending on which cards are added throughout the Year of the Dragon. Main idea about this card is, 'Well, look at these tech cards I totally need to beat like 1/3 of the meta. So, I can't cut them. But, they are also clunky, and takes up some space in my hand at this point of the game. What do I do? Guess I'll just send them back to my deck, and draw them later, because I am warlock and I have infinite draw anyways' Of course I can't say that its meta breaking, but I am almost certain that its better than you give it credit for. And, that it will see play in any warlock deck, maybe just one copy, maybe even two, time will tell. I'll add one more thing; if this card read 'Send them back to your deck, and draw as many 'DIFFERENT' cards, it would be busted. In this form, it can draw the card you already had. I am still excited about this card.